It’s absolutely vital to be in the present moment during each shot. For a shot to be the beautiful, fluid, hitch-free, confident, effortless motion you’d like it to be, you can be occupied with nothing else. If you’re down on a shot, but you’re still thinking about the great shot you just made, you are not in the present moment – you’re focused on the past at the cost of losing your awareness of what’s happening in the present. How about when you’re down on a shot, but the little player in your head is already celebrating that this rack is done, or this match is over? This ever happen to you? Didja miss? Or worse, that nagging, whiny voice in your head is focusing you on uncertainty and doubt, robbing you of the confidence you need to shoot fearlessly in the moment. Yeah, never happens to me either. In all of these situations, you’re not living in the present moment. You’re living in the past or the future. It’s not real, and it’s not what’s happening right now, in front of you, at the table. I believe a significant factor in why we love the challenge of pool is simply that good pool requires our full attention. We love to be fully engaged with difficult but rewarding activity. Pool challenges us physically, psychologically, and intellectually. And on top of that, it’s a performance art. We often do it in public, with a critical audience, under pressure. To play well, there just isn’t room for anything but the present moment. If we’re busy whipping ourselves or congratulating ourselves over some shot (the past), or if we’re busy imagining a win or worrying about a possible miss (the future), guess what? We’re not right here, right now, fully engaged in the shot. With your attention stuck in the past or the future, you tend to miss through simply not focusing enough attention on what you’re doing. Your attention is divided. Obviously, to perform at your best, you should be giving your undivided attention to each and every shot. The real trick is to catch yourself when you’re not present – before you shoot. When you’ve just made a great shot, or if the pressure of a situation is distracting you, don’t rush up and shoot the next shot! Take a lap or two of the table, wash your hands, touch up your tip, stretch, whatever. Do something to pass a little time and get past whatever it is, so you can focus on the present shot. Go down on the shot when you feel ready and clear. Another type of distraction also plagues pool players. It’s a biggie. I call it “Blacking Out”, and I think the cause is self-consciousness. We are distracted by our awareness of the fact we are performing, by the pressure of the game or match, by the fact we are being watched, or by who is watching. We can be caught up in mechanical issues of form & stroke, and be distracted from the task of the moment – delivering an appropriate, properly aimed stroke. When our attention goes to what we look like or how our movements function, we’re no longer focused on the practical pool challenge of the moment. We may be doing something worthwhile, but it’s not what we need to be doing during play. This is performance. To perform with beauty and excellence, we need to be present and alive in the moment by moment unfolding of the action. Self-conscious players sometimes black out during the hit swing. They lose presence and go black during the hit. They may not be seeing. They may not hear. They have no clear body memory of the hit stroke. After going to great lengths to line up the shot and get ready to deliver a precise stroke, their awareness is elsewhere during the critical moment of execution. “Where was your attention during the hit? Where were your eyes? What were you seeing? Did you see the cueball hit the object ball?” Shoot some shots. Immediately after each shot, reflect on what happened during the hit. What are you seeing? Are you blacking out for an instant? Are you there for the whole shot? Try to stay focused and really witness the cueball/object ball collision. To do this, you have to be present. Consciously intending to stay present through the whole swing is the first step. It also helps to have a “go/no-go” point for your pre-shot routine, a point where you consciously decide whether the shot is a go or it needs adjustment. If the shot’s a go, and you’re a go, then go. Try to stay with the shot from decision to completion. If it needs more than a micro-adjustment, come up and re-focus, get present, and go down again. In occasional practice sessions, shoot some racks of balls, keeping track of the percentage of shots where you were fully present in the shot. With awareness of your tendencies, and a little vigilance, you can improve. It’s hard to win when you’re not present, but it’s easy to lose. 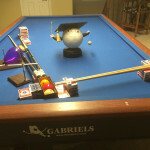 Playing pool, we revel in the joy and misery of unfolding strategies, rolls, shots, games, matches, and money. Let’s do it fully, taking our best shot, every shot. Present moment, only moment. Present shot, only shot.